Have you ever thought about how living in a new country might affect you, and how you might deal with what’s often called ‘culture shock’? To me, the first couple of months in the UK at my host University back in 2006 felt like a complete high. Everything was so exciting and I just wanted to take it all in. I can honestly recommend Chapter 4 Dealing with culture shock in the new International Students’ Survival Guide. I’m sure that if I’d read it before my experience abroad, I could have managed myself and the way I was going to adjust to a new way of life a lot better. It’s really good to know what to expect – so sign up and have a read – it’s completely free of charge! Sign up for the International Students’ Survival Guide and read the new Chapter 4 Dealing with culture shock. It’s great to discover a culture that’s foreign to what you are used to by living in a new place. And of course it’s not ‘high culture’ that I’m talking about. I mean all the little things that seem normal to the people living in a country, but might feel a bit strange or unusual to outsiders. Coming from another European country, I thought there wasn’t going to be much new to discover for me in the UK. Not quite true, actually. Here are my top 3 discoveries of the British way of life. Politeness: It’s lovely to be spoken to at the supermarket till, to discuss the weather when buying vegetables at the grocery shop around the corner, and to be apologised to when somebody accidentally steps on your foot on the bus. The most popular topic for these conversation is another all time British favourite – the weather. Sometimes the real meaning of polite formulas and conventions are tricky to pick up for a non-native speaker like me. For example, ‘I wonder if you’d be able to’ or ‘Would you be kind enough..,.’ both actually and straightforwardly mean ‘Can you please do this or that’. Here is a funny take on some more examples of what the Brits might politely say and what they actually mean. Are you alright there, love? When I arrived in the UK, I was completely startled by people constantly asking me if I was alright. I wondered if people thought I looked pale or sickly, and that they wanted to check if I was feeling ok or if I was about to faint. I quickly found out that ‘Are you alright’ is just used as another way of saying ‘How are you’ in the UK. It’s a polite way of starting a conversation or of appreciating your presence. You’ll also hear it in shops when the shop assistant wants to check if you need a hand. Also, it’s completely normal to call complete strangers ‘love’ or ‘dear’ in the shop context. Queuing: It’s not a stereotype – people in the UK really do know how to form an orderly queue, and that’s truly fantastic! Nobody feels cheated by others being served more quickly. I’ve turned into somewhat of an obsessive ‘queuer’ ever since I started living in the UK – steadily trying to impose my queuing behaviour on fellow Austrians when I happen to be back in my native country. 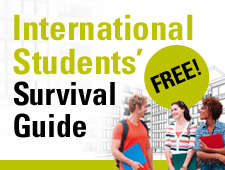 Read more about how to prepare for culture shock in the International Students’ Survival Guide! This entry was posted in Students on July 10, 2014 by admin.